Yarr arr yarr! I loddie the hotpants! We have another swashbuckling adventure for ye, ye pirate scallywags. 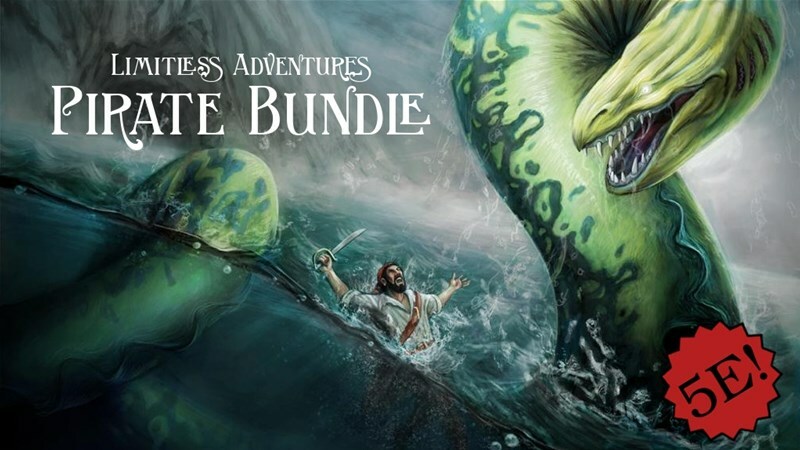 Actually, more than just a single adventure, it's a whole bunch of pirate-themed and related items from Limitless Adventures. And it's all compatible with 5th Edition. Head over to their Kickstarter and check it out. Coast Encounters - random encounters set on the coast, includes 10 5E encounters, 30 adventure hooks, and two new magic items. Flotsam - a floating pirate town with 12 full-detailed locations, a drink recipe, a dice game, 36 adventure hooks, and a new magic item. Fortune's Cutlass - Give your players a ship with a crew, game mechanics, and even some intrigue while they're sailing to faraway lands. A fully detailed sailing ship with 12 distinct locations, and 36 adventure hooks. Pirate Treasure Map - Everyone loves treasure maps, especially maps with two new monsters, a new game mechanic, 12 adventure hooks, and a new rare magic item! Sea Encounters - 10 5E encounters set at sea, 30 adventure hooks, and a new monster. In case you're counting, this book has 144 Further Adventure prompts to aid in your writing! With your help we'll take this classic and improve it with a new cover and original interior art; and finally offer it in print on a wider scale. The campaign is over its goal with 18 days left to go.